I have been busy busy making ice cream this month, and wanted to share with you a new one I made. Honestly, it wasn't what I had hoped it to be, even after my second stab. It's still good but the Rice Krispies turn out a little soft. Maybe this is okay to those who like their cereal with milk, but I really don't like milk in my cereal for the very reason that it turns the cereal soft. Then came the ice cream. I wanted to go for a marshmallow base. A Google search lead me to this one from the Blue Ridge Mountain Ice Cream Store. I made it, but personally, without any eggs, I found the recipe to be too much like frozen milk. That's not to say other people wouldn't like it -- I just prefer my custard based ice creams. 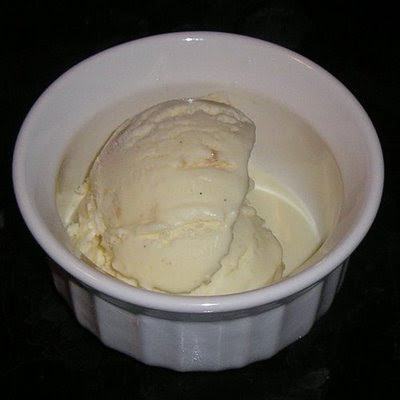 Then I tried altering a vanilla based ice cream with advice from Gail Damerow in Ice Cream! : The Whole Scoop . This created a lovely marshmallow flavored ice cream. Stir occasionally, until the mixture is warm (not boiling though). Slowly add warm milk mixture to the whisked egg mixture, and whisk until mixed. Return entire mixture to the stove, and heat until the mixture begins to coat the back of the spoon. Do not bring to a boil or you will have scrambled eggs. Pour the mixture through a strainer into a clean bowl -- discard the solids that remain in the strainer. Chill overnight. Pour chilled mixture into an ice cream maker and churn according to the ice cream maker's directions. I then broke my reserved Rice Krispie Treats into bite sized pieces and added them to the ice cream maker during the last five minutes of churning. The ice cream was good. Again, my only complaint is the sogginess of the Rice Krispies. Surprisingly I didn't find it too sweet. My husband liked it, but he said it wasn't as good as the coconut. (See yesterday's post.) He also said it tasted like vanilla. When I asked about the Rice Krispies, he said he hardly noticed them -- well, then I guess they didn't bother him, anyway! LOOKS AMAZING TASTY. GOOD PHOTOGRAPHY.